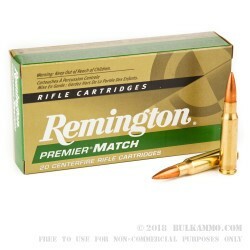 This 308 Win cartridge from Remington’s Premier Match line of ammunition sports a match-grade 168 grain boat tail hollow point Sierra MatchKing projectile. The MatchKing is optimized to deliver tack driving accuracy, and has a very thin jacket drawn to an exacting concentricity standard of 0.0003 in maximum variation. This bullet’s boat tail design significantly reduces its base drag, giving it a substantially higher ballistic coefficient than a comparable flat base bullet. That means it has a lower sensitivity to the effects of cross winds, a flatter trajectory, and higher energy delivery as well. 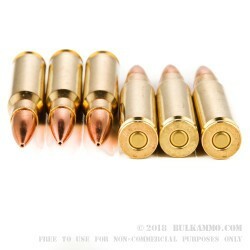 Finally, this hollow point bullet will expand dramatically when it hits a target, giving you the stopping power you need to drop medium to large game fast. 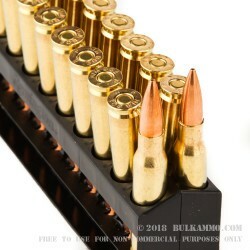 This round further offers a non-corrosive Boxer primed factory fresh brass casing, so even 20 of them can keep you effective in the woods for multiple upcoming deer seasons. 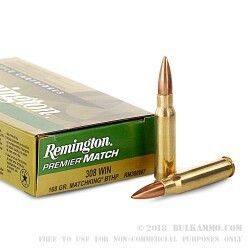 Remington’s over 200 years spent producing quality products are brilliantly reflected in these hard-hitting cartridges!